1. Two-way cross-border RMB cash pooling refers to an operating and financing activity within a multinational corporation carried out to regulate surpluses and deficiencies of cross-border capital of non-financial (i.e. non-banking) institutions and enterprises inside and outside China in accordance with the operating and management requirements of their business. 2. The headquarters of a multinational corporation might designate their host enterprises, which are incorporated under the PRC law with a separate legal personality and are in actual operation or currently engaging in investment activities (including finance companies), to develop two-way cross-border RMB cash pooling. 3. Two-way accumulation comprises the main account of the domestic cash pool accumulating funds from the domestic cash pooling member for lending as well as the collection of funds from the foreign cash pooling member for overseas borrowing. Both means of accumulation are indicative of loan financing between companies. Establishing a two-way cross-border RMB cash pool could help the corporate group collect surplus funds within the group itself so that member enterprises in the cash pool have access to the surplus funds, which enables the group to reduce the overall finance costs and facilitates an efficient use of funds internally, thereby maximizing the return on funds. By the end of 2016, a total of 1,716 two-way cross-border RMB cash pools had been set up across the country. In addition, cross-border collection and payment of cash were taking place in 1,052 cash pools, amounting to 876.66 billion yuan in total receipts, 875.89 billion yuan in total payments as well as a net inflow of 770 million yuan. The development of cross-border RMB cash pooling in China can be traced as below. 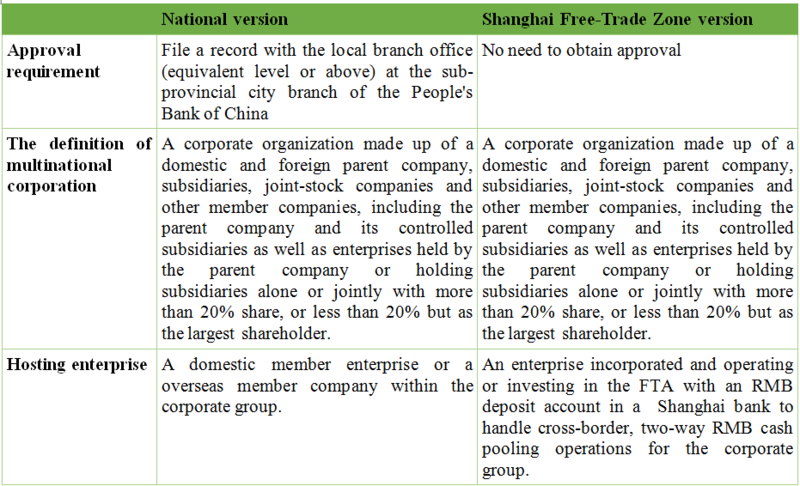 In February 2014, A Notice on Expanding the Cross-border Use of RMB in China (Shanghai) Free Trade Zone Supported by the Shanghai Headquarters of People’s Bank of China was promulgated which approved the establishment of cross border two-way RMB cash pools by enterprises in the pilot zone based on the operating and management needs of their business. In June 2014, Several Opinions of the General Office of the State Council on Supporting the Steady Growth of Foreign Trade were released, which represent the national version of the regulatory framework for two-way cross-border RMB cash pooling. Multinational corporations can conduct cross-border RMB business by centralizing cash operations subject to the relevant provisions issued by the People’s Bank of China, including cross border two-way RMB cash pooling business processes, regular cross-border RMB centralized payment and receipt processes etc. In November 2014, the detailed implementation rules for two-way cross-border RMB cash pooling were introduced. The Notice by the People’s Bank of China on Relevant Matters Concerning Multinational Corporations’ Cross-border Operation of RMB Funds requires both domestic and overseas member companies of multinational corporations to have been in continuous operation for more than three years, while the total revenue of domestic member enterprises in the previous year shall not be less than 5 billion RMB, and the total income of overseas member companies in the previous year shall not be less than 1 billion RMB. In September 2015, The Notice by the People’s Bank of China on Further Facilitating Two-way Cross-border RMB Cash Pooling for Multinational Corporations was released. 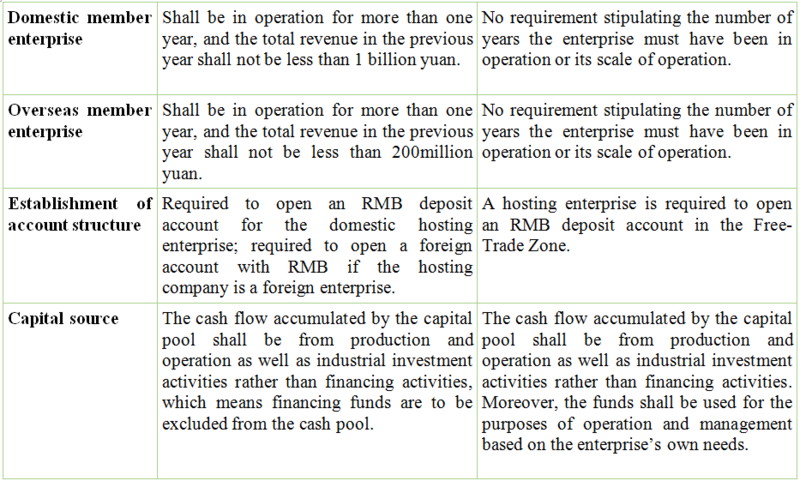 This notice lowered the threshold for enterprises in the national version to establish a cash pool, requiring both domestic and overseas member companies of multinational corporations to have been in continuous operation for more than one year, while the total revenue of domestic member enterprises in the previous year shall not be less than 1 billion RMB, and the total income of overseas member companies last year shall not be less than 200 million RMB. In December 2015, The Instruction of People’s Bank of China on the financing supporting for Construction on China (Guangdong) Free Trade Zone Pilot Site was released, permitting eligible enterprises in the free trade zone of Guangdong Province to carry out cross border two-way RMB cash pooling activities based on the operating and management needs of their business. In May 2016, the free-trade zones in Guangdong as well as Xiamen area issued their own implementation regulations. In November 2016, Shanghai Free-Trade Zone promulgated the “Full functionality of cash pooling”, the detailed implementation rules of which are embodied in The Notice by the Shanghai Headquarters of People’s Bank of China on Further Expanding Cross-border Financial Services Function in Free Trade Zone to Support Technological Innovation and Real Economy. In April 2017, the plan under which the third batch of free trade zones were to be set up proposed the classification of cash pooling as a financial innovation. In June 2017, the “Full functionality of two-way cross-border cash pooling” in Shanghai was implemented. In August 2017, the third batch of free trade zones including Henan was established. Under the regulations, multinational corporations may set up a cross border two-way RMB cash pool in accordance with the relevant policies delineated in the national version and the pilot free trade zone version and based on their own business needs. However, the same domestic member enterprise is restricted from joining more than one cash pool. The tax in respect of the two-way cross-border RMB cash pooling under this new rule covers four main types of tax: stamp duty, value-added tax, enterprise income tax and withholding tax. It is imperative that enterprises have a solid grasp of current policies and regulations as well as take into account their own fund and cash management needs when they are planning to establish a two-way cross-border RMB cash pool. CW CPA can help overseas companies analyze the feasibility of setting up operations in China’s free trade zones and utilize the advantages offered by the above-mentioned cash pooling schemes as well as preferential tax policies to do business in China. Further questions regarding cross-border RMB cash pooling in free trade zones and foreign direct investment into China can be addressed to Ms. Phenix Zheng (phenix.zheng@cwhkcpa.com).